Professor Black joins the faculty of the new Master of Public Health degree program from a postdoctoral position in the School of Public Health at the University of Illinois at Chicago. As a postdoctoral fellow, she investigated the psychosocial and cultural factors related to African American women's health and health disparities, including the influences of racial discrimination on health outcomes. 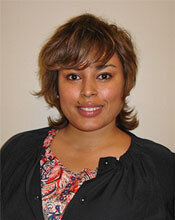 She also was named a Health Disparities Research Scholar by the National Center on Minority Health and Health Disparities. Professor Black completed her Ph.D. in child and family development at the University of Georgia. To explore factors related to African American women's health disparities, she conducted a content analysis of magazines and blogs that are popular among African American women, and a secondary analysis of data on more than 800 rural African American families in Georgia and Iowa from the Family and Community Health Study (FACHS). While African American women used daily behaviors such as role management and coping in real life to protect their physical and mental health, the popular media illustrated stories of African American women who were managing responsibilities of family members, co-workers, and friends, sometimes to the detriment of their own self-care, while surviving harrowing circumstances. "These expectations [for survival] are shaped by a social history of ancestors and generations of black women who persevered during some of the most intense racial and gender oppression this country has ever seen," Professor Black said. "Though I take this social history and survival mode into consideration while deconstructing health disparities, I also must find a way to disentangle those parts that generate pride from those that have real consequences for the day-to-day physical and mental health of African American women." As she continues her research on the relationships between daily life management and health outcomes experienced by women of color, Professor Black also plans to explore multimedia technologies for the dissemination of health information and interventions to this group, and to narrow the communication gap between patients and health care providers by developing cultural awareness training programs. She is particularly interested in impacting the stigma that surrounds mental health issues in the African American community. She would also like to add to the discussion of health disparities the perspective that one's biases, backgrounds, and life views may inhibit a health care provider's ability to connect with and serve people who need the most help. In educating future public health practitioners in the Master of Public Health program, she wants to help students, as she put it, "to own and to recognize that who we are is linked to how we perceive and 'treat' others." Her teaching will focus on social determinants of health, and cultural competency and awareness.